Affinity launched in Tottenham right at the end of 2016. It was initially based in two delivery containers in the yard of Five Miles – a craft beer bar and music venue. The brewery has since relocated to Bermondsey in south east London, along the so-called beer mile. Their 2.5-barrel kit was sold on as part of the move and they now brew on a 6-barrel kit housed in a railway arch. Founders Ben Duckwork and Steve Grae met whilst working as part of London’s thriving beer scene. Grae, a former home brewer, honed his skills at Bermondsey’s Brew by Numbers before going into business with Duckworth. 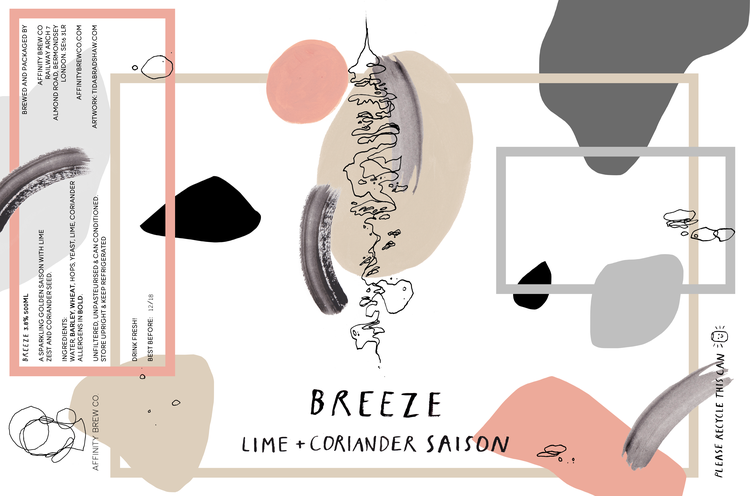 Breeze started life as a home-brew experiment to combine a hoppy English golden ale and a spicy Belgian saison. The idea was to produce a sessionable sparkling ale that was bold enough in flavour to stand up to spicy food. The lime zest adds a refreshing acidity and the coriander helps to accentuate the spicy, peppery character of the yeast. UK Challenger hops provide a wonderfully pleasant bitterness and a fresh grassy, floral aroma. NOTE: This recipe requires 20g of Lime Zest to be added to the boil which is not included in this kit.